Former Arsenal player and cult-favorite shithead Nicklas Bendtner famously once unbuckled his pants, rubbed his junk up against a taxi, and then spanked the presumably titillated but bewildered vehicle with his just-removed belt in a fit of anger aimed at the cab’s driver. On Sunday, Bendtner was once again made angry by a cabbie, though this time he skipped the foreplay with the car itself and went straight to the violence with the cabbie inside—quite possibly for good reason this time. Details of yesterday’s events are still pretty scarce, but here are the facts we know at this point: At 2:41 a.m. local time on Sunday morning in Denmark, a cab company reported Bendtner to police after an altercation between the Danish soccer star and a taxi driver. The taxi company’s communications director confirmed that one of their drivers had been attacked earlier by a rider, that this driver had undergone surgery due to a broken jaw sustained during the incident, and that they believed the assailant to be Bendtner. Danish Police confirmed to Danish paper BT that they had been notified of a violent incident between a cabbie and a passenger, but they would not confirm the passenger’s identity nor if any charges had been filed. Bendtner’s current employers, Norwegian club Rosenborg, put out a statement that said a “very heartbroken” Bendtner personally contacted the club after the incident to break the news to them, and that the club is in the process of gathering all the information. Bendtner’s girlfriend, model Philine Roepstorff, says in an Instagram post that she was in the cab with Bendtner that night and saw the whole thing go down. So it seems safe to say that at least something did go down between Bendtner and a taxi driver that night. Of course, it’s what we still don’t know for certain—mainly, what exactly inspired Bendtner to apparently slug the driver so hard the man’s jaw got busted—that is of most intrigue. Judging from the cab company’s statement, they seem to feel like Bendtner was the one at fault. Bendtner’s history of drunken antics might have you believing the same. However, there is reason to believe that the story is more complex than it might seem on paper, and that Bendtner might have even been fully in the right. According to her, Bendtner and Roepstorff got into a cab at around two in the morning looking to go back to Bendtner’s home after a night on the town. The bar they were coming from wasn’t too far away from their destination, but she and Bendtner noticed the driver taking them on a circuitous route that increased the cost of the ride. Because of this, the couple told the driver they would not pay the fare and demanded that he stop the car and let them out. This, Roepstorff claims, made the driver “go crazy.” She says the cabbie spun the car around to follow Bendtner and Roepstorff and yelled cuss words at them as he drove toward them. Once he neared the couple, the driver apparently got out of the car, charged at them, and threw a bottle of something at Roepstorff. The bottle narrowly missed hitting her. The driver kept advancing toward the couple, and when he was within arm’s reach, Bendtner struck him “once,” according to Roepstroff. 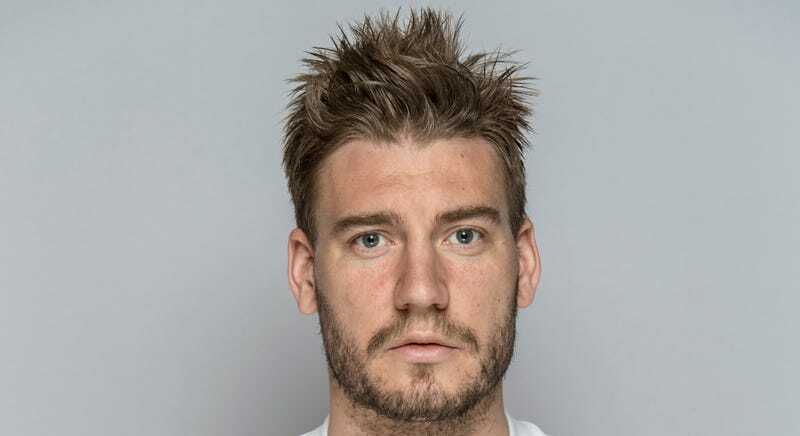 Rosenborg’s statement included a line that said Bendtner would be back in training this week as the club assesses the situation and decides what, if anything, to do about it. As of now it doesn’t seem like the police have pressed charges, though that could change. All we think we know for sure is that Bendtner can strike a jaw just about as well as he can strike a ball, and that he should probably stay away from cabs.